When I hear people talking about Pennsylvania’s farmland preservation program, they often know that our state’s program is the largest of its kind in the nation. Indeed, it is. In August, we preserved our 5000th farm. Those farms cover more than 525,000 acres in 58 counties. The public’s recognition of this achievement is a testament to advocates who have worked tirelessly over three decades to safeguard some of our most fertile lands from the threat of development. But simply preserving farms is not enough. We need to think about how to transition those operations to the next generation so they remain in production agriculture and so the public continues to reap the benefit of this significant investment in agriculture's future. Since 1989, the state has made the very intentional public policy choice of investing $1.4 billion to purchase easement rights that prevent farms from being used for anything other than production agriculture in perpetuity. Let me stress that point: in perpetuity. The average farmer is about 58 years old. Many are thinking about retirement and how to transition their operations to the next generation. For some, that may mean simply selling the land to a developer, but for the preserved farm owner, they are bound by the covenant contained in that easement purchase agreement to ensure the farm remains in production. Increasingly, this will become an issue. One in four preserved farms has already changed hands. 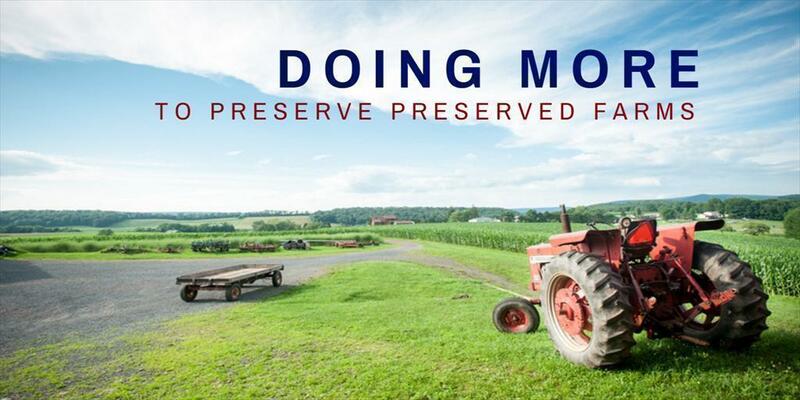 Helping those three out of four preserved farm owners develop a succession plan is a priority of Governor Wolf, which is why we created the Preserved Farm Resource Center. The center aims to connect preserved-farm owners with facilitators, accountants, financial planners, and lenders who can guide them through the succession planning process. Developing a farm succession plan can be complicated, and there is a cost involved for professional service providers. In September, we announced a new grant program to help farmers cover those costs. Individuals can apply for up to $3,000 that can be used as a one-to-one match to reimburse their cost of assembling and using a succession planning team. Grant applications are available online​ or by contacting the Bureau of Farmland Preservation at (717) 787-4737. We’ve held town hall meetings with farmers across the state about this topic, and the need for this service resonates with them. Last week, for example, I visited the Lebanon County Ag Center where I met with 42 producers – some from as far away as Bucks County – who came to find out how they can start planning for tomorrow. Farmers care about the future of their operation, and for many, it’s an open question as to how the farm will be passed on to the next owner or the next generation. We want to help producers answer that question – not only for their sake, but also to ensure the public continues to realize a return on the $1.4 billion that has been invested to date and in order to protect Pennsylvania’s ability to grow feed and sustain our people for generations to come.